November 25, 2008 | Muscles taught, face down, every nerve in her body ready to explode, and at the shot of the gun, no thoughts, just power. Running ceases to be a hobby when you are an athlete at the collegiate level. When the track season lasts from August to May, and requires at least 20 hours of practice a week it becomes a way of life. Although the workouts are demanding, and the pain intense, the athletes come to expect it. Most athletes come into the program having broken their high school records, or leading their teams. Hard work is nothing new for these athletes. This couldn't be more true for Jennifer Day. Day attended Layton high school. 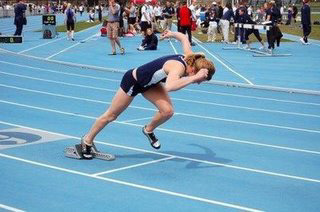 She took tenth at state her junior year, and lettered with All-state honors all four years. The track program at Layton high school wasn't organized at the time. Day made up all her own workouts, and when possible she practiced with her main rivals from other high schools. Day's high school times caught the attention of Lifetime products. They were impressed with her hard work and awarded her with a scholarship. Day also received a scholarship from Utah State. "I never thought it would be worth it," Day said, "especially when I was struggling through practices by myself." Day's commitment to her sport endured through even the toughest of times. Day's first year in college she contracted one of the worst cases of MRSA staph infection in the U.S., because of this she couldn't train to her full potential. However, the infection didn't stop her. She has come back every year, and trained hard. Day said, every year the athlete gets stronger and more comfortable, so most get the best times in their last two years. "It has been rough getting hurt, but I feel strong," Day said "this year is going to be awesome." Running has to be your obsession, you have to be completely dedicated to it, said Day. There was a time when Day stopped running for about six months, but realized it was so much a part of who she was she couldn't quit. After sprinting for almost nine years, it is hard to think about life without running, said Day. However, Day is staying focused on the years she has left. Day is a senior at Utah State University. She is studying for a major in dietetics and a minor in chemistry. Day is planning to work in South America as an international dietician when she graduates.